The National Gallery of Victoria (NGV) was opened in 1861 and is Australia’s oldest art gallery. The NGV consists of two venues: the NGV International located in Melbourne’s Southbank cultural precinct, and the Ian Potter Centre: NGV Australia, in nearby Federation Square. Before entering NGV International, be sure to appreciate the beauty of the building itself. The gallery’s imposing solid grey exterior is contrasted with the water features that surround it and the waterfall that gently cascades down its glass entrance. Once inside, stand beneath a rainbow of light under one of the world’s largest stained-glass ceilings. The NGV International houses an extensive permanent collection of more than 66,000 artworks from Europe, Asia, America and Oceania. Browse sculpture, drawings, painting, photography and antiques created by international and domestic artists. The international collection houses works by the giants of the art world, including Bernini, Cézanne, Corregio, Manet, Monet and Picasso. The NGV also hosts major touring exhibitions from Europe, America and Asia. Just a short stroll away in Federation Square, the Ian Potter Centre: NGV Australia has a collection devoted entirely to Australian art. The gallery features both indigenous and non-indigenous work from the colonial period (1788-1901) through to the present day. The collection is varied, featuring painting, photography, fashion and textiles, decorative arts and an extensive collection of indigenous work. The Ian Potter Centre gives visitors a fantastic overview of how Australian art has developed. Of note are works from the famous Heidelberg School, the movement during which local artists strived to encapsulate the key aspects of Australian life, light and nature. NGV International is open daily except Tuesday, while the Ian Potter Centre is closed Mondays. Both venues are closed Christmas Day and Good Friday. Admission is free except for some temporary and touring exhibitions. Tours and audio guides are available at both for a fee. The NGV galleries are located in close proximity to one another; the NGV International is on St. Kilda Road and the Ian Potter Centre is located in Federation Square. 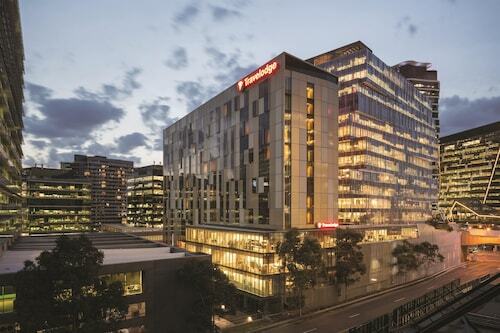 Both are a short walk from Flinders Street Station, the city’s main train terminal. 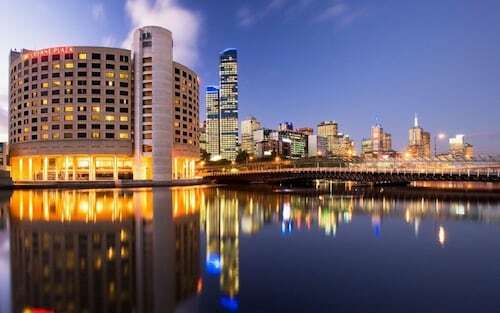 This family-friendly Southbank hotel is located in the entertainment district, within 1 mi (2 km) of Melbourne Central and Melbourne Cricket Ground. Royal Botanic Gardens and Marvel Stadium are also within 2 mi (3 km). Flinders Street Station is 7 minutes by foot and Melbourne Central Station is 19 minutes. 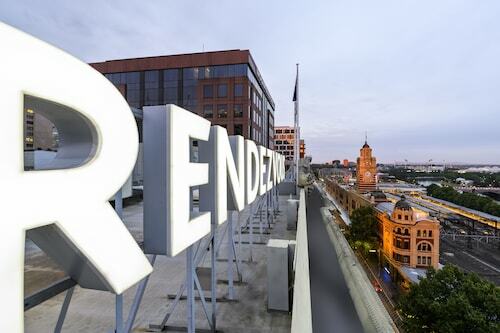 This family-friendly Melbourne hotel is located in the entertainment district, within a 15-minute walk of Federation Square, National Gallery of Victoria and Melbourne Convention and Exhibition Centre. Melbourne Central and Melbourne Cricket Ground are also within 1 mi (2 km). Flinders Street Station is only a 4-minute walk and Melbourne Central Station is 16 minutes. 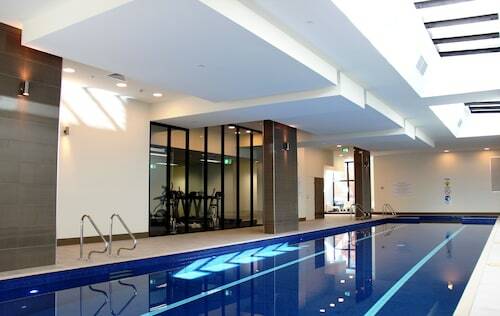 Located in Melbourne Central Business District, this apartment building is within a 10-minute walk of Collins Street, SEA LIFE Melbourne and Flinders Lane. 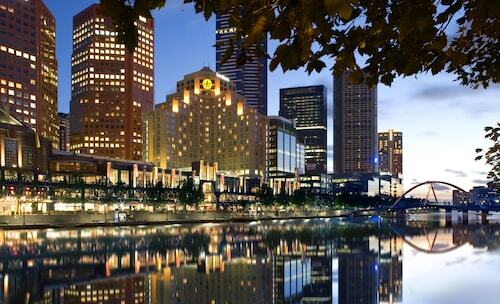 Melbourne Convention and Exhibition Centre and Bourke Street Mall are also within 15 minutes. Spencer Street Station is 8 minutes by foot and Flagstaff Station is 11 minutes.